Osmosis: Hypernatremia. (2019, April 20). Retrieved from (https://www.osmosis.org/learn/Hypernatremia). Hypernatremia is an elevated sodium level in the blood. Normal serum sodium levels are between approximately 135 and 145 mEq/liter (135 - 145 mmol/L). Hypernatremia is generally not caused by an excess of sodium, but rather by a relative deficit of free water in the body. For this reason, hypernatremia often coincides with dehydration. Hypernatremia is defined as sodium levels greater than mEq/L. Which of the following choices shows the amount of water lost by this patient? 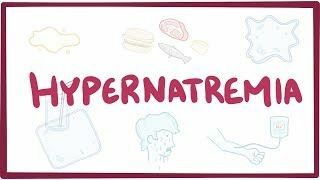 With hypernatremia, hyper- means high, and -natrium is latin for sodium, often shortened to Na+, and -emia refers to the blood, so hypernatremia means a higher than normal concentration of sodium in the blood, generally above 145 mEq/L. The concentration of sodium depends on both sodium and water levels in the body. About 60% of our body weight comes from just water, and it basically sits in two places or fluid compartments—it either outside the cells in the extracellular fluid or inside the cells in the intracellular fluid. The extracellular fluid includes the fluid in blood vessels, lymphatic vessels, and the interstitial space, which is the space between cells that is filled with proteins and carbohydrates. One third of the water in the body is in the extracellular compartment, wheres two thirds of it is in the intracellular compartment. Normally, the two compartments have the same osmolarity -- total solute concentration -- and that allows water to move freely between the two spaces.But the exact composition of solutes differs quite a bit. The most common cation in the extracellular compartment is sodium, whereas in the intracellular compartment it’s potassium and magnesium. The most common anion in the extracellular compartment is chloride, whereas in the intracellular compartment it’s phosphate and negatively charged proteins. Of all of these, sodium is the ion the flits back and forth across cell membranes, and subtle changes in sodium concentration tilts the osmolarity balance in one direction or another and that moves water. This is why we say “wherever salt goes, water flows”. So with hypernatremia, someone can have a high concentration of sodium in the extracellular fluid and therefore the blood, by either losing more water than sodium, or gaining more sodium than water. Either way this increases the sodium concentration in the extracellular fluid, draws water out of the cells. When hypernatremia develops over a long period of time, the cells get time to adapt and they start generating osmotically active particle, which ends up preventing water from being lost via osmosis. However, when hypernatremia develops acutely, the cells get no time to adapt, and the loss of water leaves them shriveled up and can cause them to die. Now, there are several common causes of hypernatremia via water loss. All of us lose some free water everyday without even realizing it, for example through sweat as well as in the moisture breathed out during normal breathing. Under normal conditions, this loss is replaced by the water we drink but this balance can be tipped when you have a high fever or exercise a lot on a hot summer day. In those situations, you can have temporary hypernatremia which is easily fixed by drinking lots of water. Another way that the body can lose free water is through the kidneys. When the nephrons filter blood and form urine, some of the water in the filtrate is reabsorbed in the distal convoluted tubule and the collecting duct. When you’re dehydrated, the hypothalamus releases antidiuretic hormone also called ADH or vasopressin, which acts on receptors on the nephron to boost its ability to reabsorb water. So if there’s brain damage affecting the part of the hypothalamus that controls the release of ADH, then ADH levels could fall and the nephron wouldn’t reabsorb as much water, meaning more fluid gets lost and the urine becomes more dilute, and the sodium concentration in the blood gets more concentrated. This is called central diabetes insipidus because the fault lies centrally, in the hypothalamus. Another possibility is that the hypothalamus makes ADH normally, but the receptors in the kidney stop responding to it. This time the fault is in the kidneys, so it’s known as nephrogenic diabetes insipidus. Again the urine becomes dilute and the sodium concentration in the blood becomes concentrated. Alternatively, there might be brain damage that only affects the thirst center in the hypothalamus rather than the ADH secreting part of the hypothalamus. Here, the kidneys aren’t losing water, but the person is drinks too little water while still losing some through sweat, urination, and breathing, again resulting in hypernatremia.